About 35 people showed up at the Oconee County Library in Watkinsville tonight to hear citizen activist Russ Page talk about a proposal for a park surrounding Elder Mill Bridge and Elder Mill itself and two Oconee County officials say why the plan for a county park is not feasible. Later in the meeting, however, Holcomb acknowledged that she uses Eagle Tavern in downtown Watkinsville and the Elder Mill Bridge heavily in her promotional materials for the county. She said the bridge also is in the state tourism guidebook, the Antebellum tour guidebook and the Southern Living tour book. “We use that covered bridge for just about any publication that we use,” she said. Wayne Provost, strategic and long-range planning director for the county, said the county is expected to cut between $1 and $1.5 million from the budget this year and that money for a county park just isn’t likely to be available. He said it is necessary to allocate money for maintenance and operation of a park, not just for land acquisition. Page was undeterred. He said he is a farmer, and farmers plant seeds. He hopes a park will be the outcome. Jonathan R. Veit organized and moderated the forum, which lasted for an hour and 20 minutes. Among those attending was Oconee County Commissioner Chuck Horton and Board of Commissioners Chairman Melvin Davis. Davis said he was in favor of preserving the mill near the bridge because of its historic value to the county. Horton left before the public discussion of the three presentations by Page, Holcomb and Provost and did not speak. A complete video recording of the session, including the slide presentation by Page showing pictures from the bridge, the mill and Rose Creek, which flows under the bridge and beside the mill, is on Vimeo. At least some pressure is building on the Citizen Advisory Committee for Land Use and Transportation Planning to come up with a recommendation for the Oconee County Board of Commissioners regarding the future of the county courthouse. The committee meets again on Tuesday night, and Chairman Abe Abouhamdan has been pushing in recent meetings for the committee to reach some sort of decision. The group has heard from a wide range of county officials since it started deliberating on the issue in April of last year. 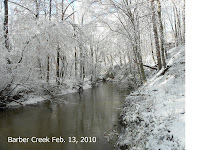 The BOC sent the matter to the citizen committee in March of 2009 to get citizen input. 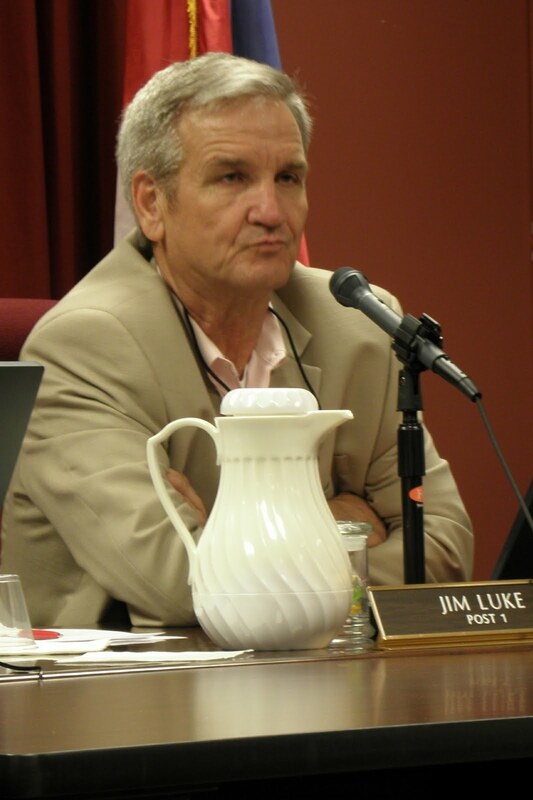 At the town hall meeting on Feb. 16, Commissioner Jim Luke expressed disappointment that no citizen had asked about the issue at the first town hall meeting in October or again that night. “I just can’t stir up anybody who has an opinion,” Luke said. Luke said he didn’t feel it was necessary to give out his telephone number so people could call him, “since most of you know where I am.” Luke owns Luke Hardware in Butler’s Crossing and on Atlanta Highway. “Come see me,” he said. Luke attended the Land Use and Transportation Planning Committee meeting in February but did not participate in the discussion. The Committee has been struggling with four options it has identified: (1) Keep all government activities in one place, (2) Separate judicial and administrative activities, (3) Do nothing, and (4), Combine administrative operations with the Oconee County Board of Education. Abouhamdan has said he hopes to have the committee vote on these at the meeting, which starts at 7 p.m. on Tuesday at the community center in Veteran’s Park on Hog Mountain road. The Committee has not spent time talking about where joint or separate facilities might be located, but two locations were mentioned briefly by members of the Committee at its February meeting. The two mentioned sites were land adjacent to the current courthouse and land adjacent to the property recently purchased by the Board of Education for future administrative offices. That second site is on North Main street north of the current courthouse but separate from it. Luke told me in a conversation we had after the formal part of the meeting on Feb. 16 that he has another property in mind. He said the county could acquire land on the U.S. 441 bypass from the U.S. Department of Agriculture. In an email message to me on Feb. 18, Luke elaborated on his comments in our conversation. County tax records show three Southern Piedmont Experiment Station properties at the intersection of U.S. 441 and Experiment Station road that are separated from the main farmland and research facilities on the northwest corner of that intersection. The largest of these–19.34 acres--is on the northeast corner and is largely inside the city limits of Watkinsville. Any court facility must be in the county seat. The property is separated from the jail by another piece of property owned by James P. Pallas of Hull. Another, smaller piece of U.S.D.A. land is on the southeast corner of the U.S. 441 and Experiment Station road intersection. It is an oddly shaped 8.64 acre tract inside the city limits that borders Harris Shoals Park. The third property, on the southwest corner, is outside city limits at present. It is 14.58 acres. Luke said his concern with the available property around the current courthouse is traffic congestion. He said that makes the property on the bypass particularly attractive. The BOC did vote last month to spend $170,000 from that fund on renovation of the Government Annex on Greensboro road south of Watkinsville. County Finance Director Jeff Benko reported earlier this year that the county received $631,266 more in SPLOST revenues than the projected $25 million. In addition, he has indicated that the unspent money was earning revenue. An open records request I filed on Feb. 14 shows that the county has earned interest of $861,049 on unspent funds as of January of 2010. The records also show that the county transferred $8.5 million to purchase two Certificates of Deposit in June of 2009. The interest income upon maturity is not reflected in the figures I obtained, Benko informed me today. Benko told me that one of the CDs is for $7.5 million and is for 12 months. The other was for $1 million and was for six months. Benko said he has checked with the county attorney and that the BOC has complete discretion in how it spends the $1.5 million in excess funds. He said this was the way excess funds from an earlier SPLOST were handled. Two events are in the planning that will highlight Elder Mill Bridge and the land around it, which at least some people in the county feel should be set aside as a county park. Melissa Steele has set for Saturday her cleanup of Rose Creek, including sections upstream and downstream from the covered bridge, as well as of Little Rose Creek, which feeds into Rose Creek south of the historic bridge. Jonathan Veit has tentatively set March 25 as the date for a “town hall forum” to discuss creation an Elder Bridge Park. Veit also has created an online petition that people can sign to support creation of a park around the wooden bridge. Steele is expecting between 30 and 35 people to show up for the Saturday morning cleanup, which will begin at 9 a.m. with a breakfast at Antioch Church Fellowship Hall on Antioch Church road, 8.4 miles south of downtown Watkinsville off SR 15. After breakfast, the volunteers will get a safety briefing, maps and further instructions before being divided into teams and heading out to designated sites on Rose Creek and Little Rose Creek or on Elder Mill road itself, which crosses the two creeks. Steele and others involved in organizing the event will provide bottled water, sunscreen, hand sanitizer, bug spray, gloves and trash bags. Steele is advising volunteers to bring along a fanny pack or day pack, dry socks and shoes, and a hat. She also recommends long sleeved shirts and long pants. “There are lots of briars and stickers along the creek,” she noted. Volunteers are asked not to bring dogs. 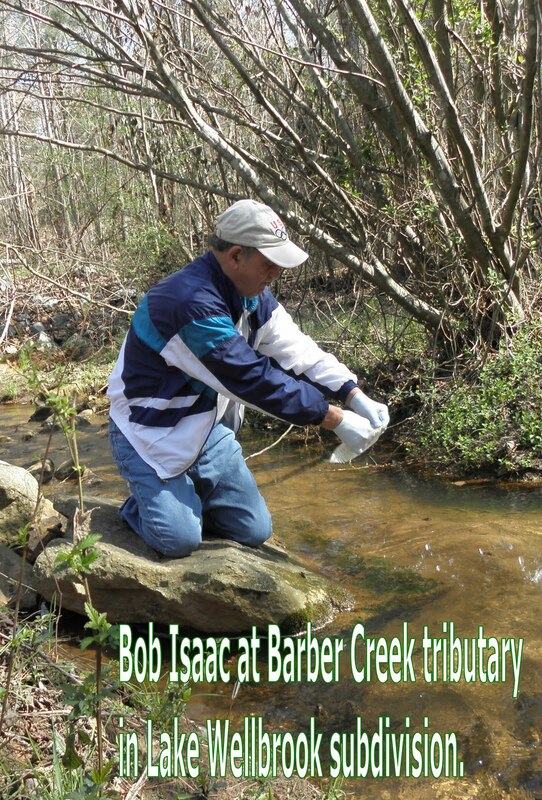 Each volunteer will be required to sign a liability waiver, based on the one used for the Rivers Alive stream cleanup program in the state. The cleanup will be moved to March 13 if it rains this Saturday. Anyone with questions should call Steele at 706 255 8528 or email her at mechanted757@gmail.com. Although the activity has been approved by the Oconee County Democratic Committee, of which Veit is chairman, the forum is nonpartisan and open to the public, Veit said. He is currently lining up speakers. 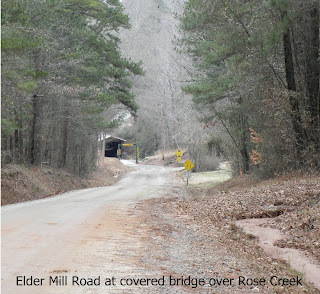 “We urge the Oconee County Board of Commissioners to make every effort possible to acquire the land surrounding the Elder Covered Bridge in an effort to create an Elder Bridge Park. After signing the petition, the signer is asked to donate to support the online site itself, but it is possible to close the page without making any contribution. Veit can be reached at Victory Communications in Watkinsville at 706 255 0222.